In these times, fundraising is never easy but when you have a group of 39 dedicated individual who believe in something, it speaks to the power of determination and pursuasion. Last year, Team Yellow Jersey Cycle-Greenwich went up against the big boys of the CT corporate world. We started with 9 people that did the bulk of our fundraising and we swelled to 20 people in the end. 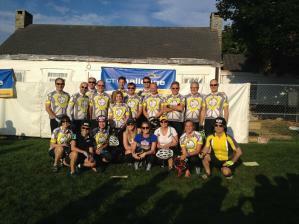 Most other companies that fielded a team for the bike ride had 30-40 people fundraising. We finished 9th in the state and contributed over $36000 to the Cancer Survivor Center in Southport, CT. Our team this year has grown and become even more focused to lead the way in the state and so far with over $26000 raised to date…and we still have 5 weeks to go! This is our team page link below so we are calling out anyone willing to help, small or big to make or endeavor even more impactful. We asking you to do your part so don’t read this and move onto the next posting, take action and make a difference, today!